Offering a fast-paced and entertaining survey of American horror movies from the silent era to the present, Nightmares in Red, White and Blue serves as good pre-Halloween viewing, both for those who are deep into the genre and those who are just interested in discovering the bona-fide classics. The talking heads that provide info about, and very intelligent social contexts for, the films include a few horror-movie historians, but the true focus is on the filmmakers. This proves utterly ideal, as these gents are indeed some of the most devoted fanboys of all. The roster includes Roger Corman (The Raven), George Romero (Night of the Living Dead), John Carpenter (Halloween), Joe Dante (The Howling), Larry Cohen (It’s Alive) and Mick Garris (Critters 2), among others. 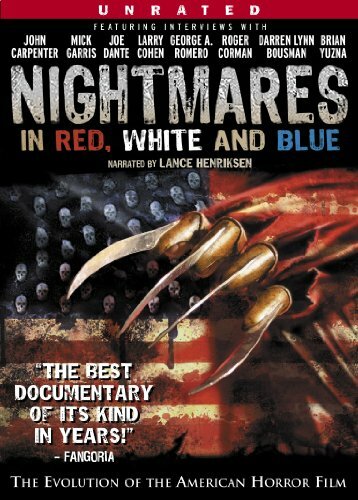 Horror movie veteran Lance Henriksen (Near Dark) supplies the straightforward (and sometimes oddly menacing) narration. 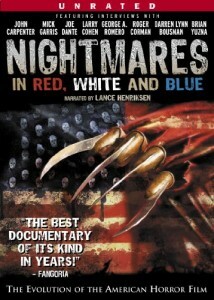 The documentary, based on the book Nightmares in Red, White and Blue: The Evolution of the American Horror Film by Joseph Maddrey , covers a lot of ground, moving from the 1910 Edison Frankenstein, Lon Chaney’s timelessly creepy silent features and the Universal monsters to major studio horrors (Psycho, Rosemary’s Baby, The Exorcist and The Silence of the Lambs) and independent films, including the slasher pics that became major franchises in the 1980s. 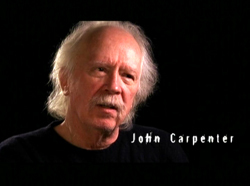 Of course, the interviewees receive more than a nod in the process; thus numerous Carpenter films are discussed, and time is even allotted to Cohen’s somewhat forgotten cult pic The Stuff. Perhaps the most impressive thing about Nightmares… is that director Monument somehow secured the rights to scenes from pretty much all of the films that are discussed. Thus the documentary is not one of the countless cut-and-paste collections of images from public-domain horror trailers that seem to pop up every Halloween; it is instead a well-thought-out, well-assembled 101 on American horror history.